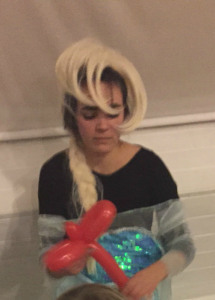 So recently there has been an up-serge of ‘Frozen’ themed parties, where someone dresses like Elsa and turns up at the party to entertain the children. – Do they look like Elsa? – Can they interact with the children? – Can they fill the duration and keep the children entertained? Unfortunately there is a growing trend of someone buying a cheap blue dress having a fancy website and starting a business. This is not only misleading but it gives people like myself a BAD name. I work VERY hard for many years to establish great feedback and make memorable parties! I have been to stacks of parties with a princess or Elsa guest appearances. Five years ago they used to do great job as there wasn’t a huge demand now a days children are bonkers about ‘Frozen’ and I see a different one every time who are just terrible! However it isn’t just me that has seen this, there is an outbreak. Here is a photo of Elsa who turned up with a Spanish accent and put her outfit on over her clothes and couldn’t sing.